After managing King’s College investment funds for almost 14 years, John Maynard Keynes decided to run a post-mortem on his investment results. He had stats for three indexes and three other institutions to compare to his results. And he had a unique set of experiences to draw from thanks to shifting ideas on what a best investment policy should be. The period he analyzed ran from January 1929 to December 1938. Despite the terrible starting point, the results were clear. Whatever he was doing, was working. He relayed the lessons from his experiences and the post-mortem in a memo to the Estates Committee in May 1938. The TLDR version goes like this: He renounces his early ideas on market timing strategies and explains why, introduces a better investment policy built around value, lays out the importance of a diversified portfolio, while patiently taking a long-term approach despite the daily swings in market prices. All of which he admits to not being easy but necessary for success. In fact the chief lesson I draw from the above results is the opposite of what I set out to show when, what is now nearly 20 years ago, I first persuaded the College to invest in ordinary shares. At that time I believed that profit could be made by what was called a credit cycle policy, namely by holding such shares in slumps and disposing of them in booms; and we purchased an industrial index including a small holding in an outstanding share in each leading industry. Since that time there may have been more numerous and more violent general fluctuations than at any previous period. We have indeed done well by purchasing particular shares at times when their prices were greatly depressed; but we have not proved able to take much advantage of a general systematic movement out of and into ordinary shares as a whole at different phases of the trade cycle. In the past nine years, for example, there have been two occasions when the whole body of our holding of such investments have depreciated by 20 to 25 percent within a few months and we have not been able to escape the movement. Yet on both occasions I foresaw correctly to a certain extent what was ahead. Nevertheless these temporary severe losses and the inability to take substantial advantage of these fluctuations have not interfered with successful results. a balanced investment position, i.e. a variety of risks in spite of individual holdings being large, and if possible opposed risks (e.g. a holding of gold shares amongst other equities, since they are likely to move in opposite directions when there are general fluctuations). On the other hand, it is a mistake to sell a £1 note for 15s. in the hope of buying it back for 12s. 6d., and a mistake to refuse to buy a £1 note for 15s. on the ground that it cannot really be a £1 note (for there is abundant experience that £1 notes can be bought for 15s. at a time when they are expected by many people to fall to 12s.6d.). Another important rule is the avoidance of second-class safe investments, none of which can go up and a few of which are sure to go down. This is the main cause of the defeat of the average investor. 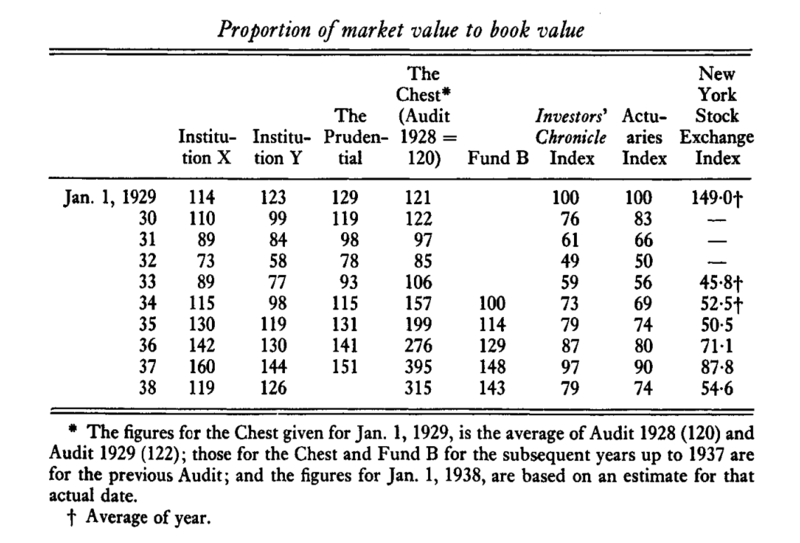 The ideal investment portfolio is divided between the purchase of really secure future income (where future appreciation or depreciation will depend on the rate of interest) and equities which one believes to be capable of a large improvement to offset the fairly numerous cases which, with the best skill in the world, will go wrong. In the main, therefore, slumps are experiences to be lived through and survived with as much equanimity and patience as possible. Advantage can be taken of them more because individual securities fall out of their reasonable parity with other securities on such occasions, than by attempts at wholesale shifts into and out of equities as a whole. One must not allow one’s attitude to securities which have a daily market quotation to be disturbed by this fact or lose one’s sense of proportion. Some Bursars will buy without a tremor unquoted and unmarketable investments in real estate which, if they had a selling quotation for immediate cash available at each Audit, would turn their hair grey. The fact that you do not know how much its ready money quotation fluctuates does not, as is commonly supposed, make an investment a safe one… But it is true, unfortunately, that the modern organisation of the capital market requires for the holder of quoted equities much more nerve, patience and fortitude than from the holder of wealth in other forms.